Polar bears are most often photographed on snowy backdrops. Many travellers don’t know that polar bears can be seen in all seasons, including summer! In summer, you can get the unique opportunity to see polar bears on land and swimming. Plus, you’ll enjoy the mild temperatures – up to 20°C (68°F) – and long, sunny days of Arctic summers. In August 2016, travellers on Polar Bears & Glaciers of Baffin Island saw a polar bear mother and cub at the water’s edge, just outside of Auyuittuq National Park near Qikiqtarjuaq, Nunavut. 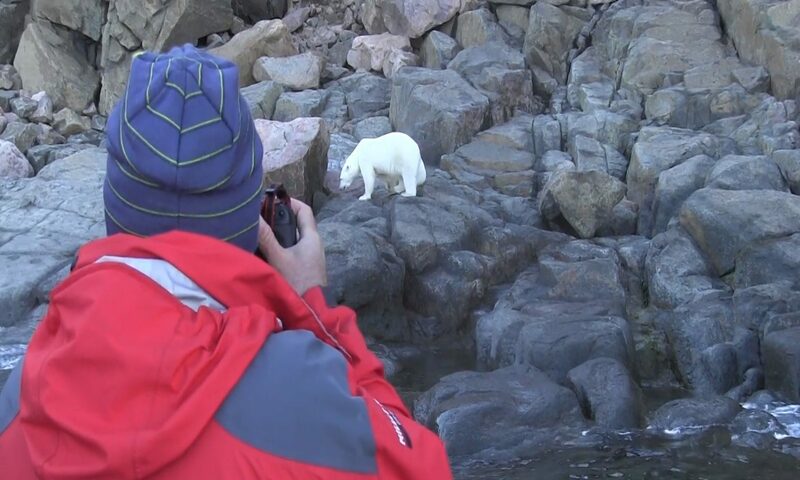 Getting up-close polar bear encounters in the wild is a once-in-a-lifetime experience that many travellers dream of. Travellers aboard Arctic Kingdom’s boat watched with excitement as a mother polar bear and her cub climbed up and down the rocks along the water. This polar bear encounter lasted approximately 45 minutes. 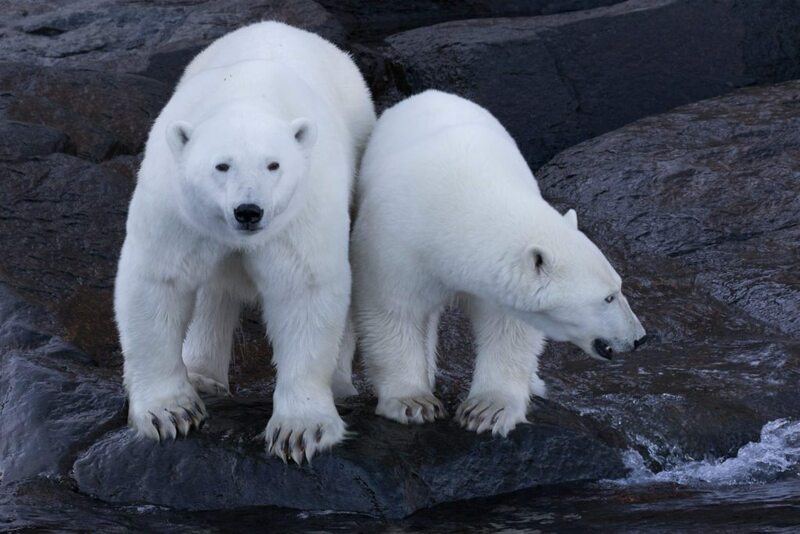 The polar bears sniffed the air and observed the travellers from the hillside for approximately 20 minutes before working their way down the hillside to the water’s edge – to the delight of the wildlife enthusiasts on the trip. “What was so incredibly special about this polar bear encounter was that it was the bears that chose to engage with us”, says Briggs. “It was such a thrill and a unique opportunity to be in such close proximity to these amazing animals, on their terms, and all from the safety of the boat”. In August, this Arctic safari not only offers polar bear encounters, but also chances to experience bowhead whales and the Midnight Sun. Travellers explore the High Arctic by land and boat, discovering icebergs, glaciers, and the spectacular landscapes of Auyuittuq National Park. This area has some of the most incredible landscapes of not only Nunavut, but Canada’s entire Arctic. In addition to boating, this trip also offers hiking, kayaking, and snorkeling in the Arctic. Departures for this trip run in August. Learn more here or contact our Arctic Travel Advisors today to book! You can get polar bear viewing opportunities from March to November. 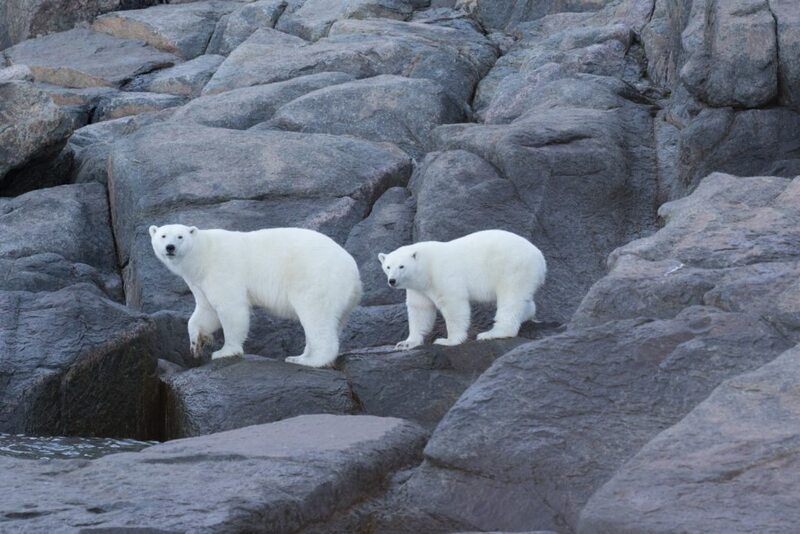 Check out our Complete Guide to Polar Bear Viewing in the Canadian Arctic to find out how. When is the best time to visit the floe edge?